As bacteria feeds on the residual sugars from the foods we eat, they produce acid. This damages tooth enamel, inevitably resulting in cavities. 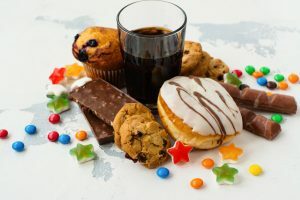 Miami’s Cosmetic Dentist Dr. Andres de Cardenas wants to share some information outlining some common food types to stay away from for optimal dental care in Miami. Although we all can appreciate a tasty pastelito or cafecito, our teeth don’t quite appreciate them as much as our stomachs. Whether your favorite soda is Ironbeer, Jupiña, Materva, Coke, or Pepsi you risk your dental health directly and its best to have optimal dental care in Miami. Soda is extraordinarily sugary and VERY acidic. This is a combination that will likely result in severe tooth decay, as well as cavities. Stay aware considering sugar-free and diet sodas as well. Although these products boast many propositions outlining their health benefits over traditional cola, they remain very acidic. Even the artificial sweeteners they contain don’t promote as much of a healthy lifestyle as you might think. Candy is sugary, sticky, chewy, and crunchy, hitting on many sensory receptors. Unfortunately, amongst hundreds of different candy types, they all remain terrible for your dental health. Most dentists, including Dr. de Cardenas, will recommend staying away from candy entirely as a part of the best dental care in Miami. Biting on hard candy is also a leading cause of broken or damaged teeth. You will likely even experience difficulty brushing soft candies like gummies or caramels from your teeth. If you cannot effectively remove these sugars from your teeth, your mouth will become a breeding ground where bacteria will thrive. For years, numerous people thought about raisins as a healthy alternative snack to sugary options like gummy and chewy candies. This tradition continues today with dried cranberries and other fruits. However, dried fruit is not a healthy option in regards to dental health. Raisins and other dried fruits are very sugary and sticky. This is a dangerous combination that cultivates a near-perfect environment for cavity and decay growth. Considering more than simply your dental care in Miami, raisins, and Craisins are very small, causing many people to overindulge on their snack time. South Florida remains renowned for its Cuban coffee. Nonetheless, even a cafecito is LOADED full of sugar that is particularly bad for both your teeth and gums. Looking past the sugar content, coffee is additionally very acidic. Coffee’s dark color and acidic nature also can stain teeth. You may find yourself with yellowed or fading teeth if you frequently drink coffee, despite never touching a cigarette in your life. Dr. Andres de Cardenas recommends avoiding coffee whenever possible as a part of your dental care in Miami. Trust us, your teeth will thank you. This is just a small sample of the many things that remain detrimental to optimal dental care in Miami. Although the list may seem endless, Dr. de Cardenas can help you cultivate a diet to optimize your dental health while ensuring you can enjoy your food and keep your mouth healthy. 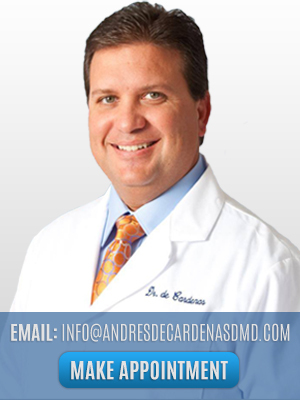 For more information on dental care in Miami and how our practice can help you, contact Dr. Andres de Cardenas and his caring team today!